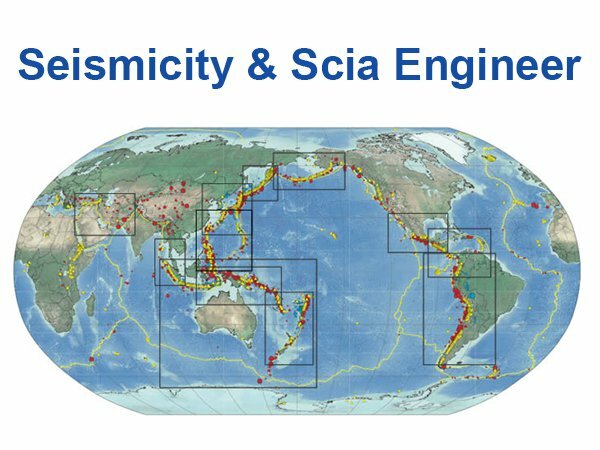 In many countries seismicity poses a serious threat to the safety of structures. Even in countries where you would not expect earthquakes, there have been incidents. Therefore most building codes today have a chapter on seismic design rules. The most advanced are Eurocode 8 and the relevant chapter of ACI318. Scia, together with its partner Penelis Consulting Engineers, provide strong support for seismic design. In Scia Engineer many provisions have been implemented, to name a few: automatic generation of masses from loads, condensed modal analysis (very fast modal analysis of large 3D models), concept of “storeys”, modal superposition and envelopes for resultants, detailed design verifications for beams, columns, walls and much more. To make the subject of seismicity understandable to all engineers, we advise that you read the recent book “Concrete Buildings in Seismic Regions” by G. Penelis & G. Penelis, CRC Press. A detailed example of how to apply the seismic design is worked out in a verification document (see the download section). It explains, step-by-step, the seismic design of the Athens Opera House & Library (architect Renzo Piano, structural engineer G. Penelis), a new iconic building in the Greek capital.